Christina Yeh focuses on the art of Chinese dances as a performer, instructor, and choreographer. 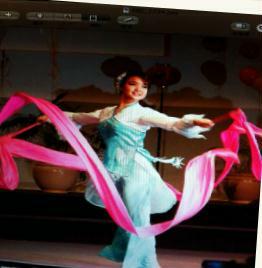 She interprets Chinese culture and traditions through various dance forms in individual and group performances. As a professional dancer, Christina began her training since her elementary school years. She graduated from Chinese Culture University with majors in dance and music. Her dance students, including both children and adults, perform for many schools, corporations, organizations and culture events. Copyright (c) Jonathan Yeh, All rights reserved.